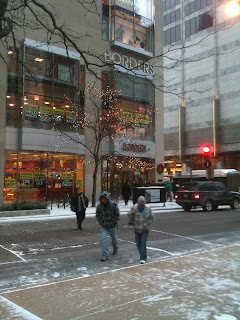 On their website the Downtown Chicago Borders is still described as a "flagship store". But yesterday the flagship sank below the surface, closing its doors for the last time. In the front section books sold for a penny each. Large sections of the four story retail area were roped off with yellow tape and warning signs. Notices over most of the shelves proclaimed 40% was the lowest discount and unsold stock would be returned to publishers. The piped music chosen by someone with a dark sense of humor segued from "it's the end of the world as we know it" to "...and now, the end is here And so I face the final curtain." The staff did not bother to interrupt their conversation about upcoming super-hero movies as they took my dime and returned a nickel and a penny. 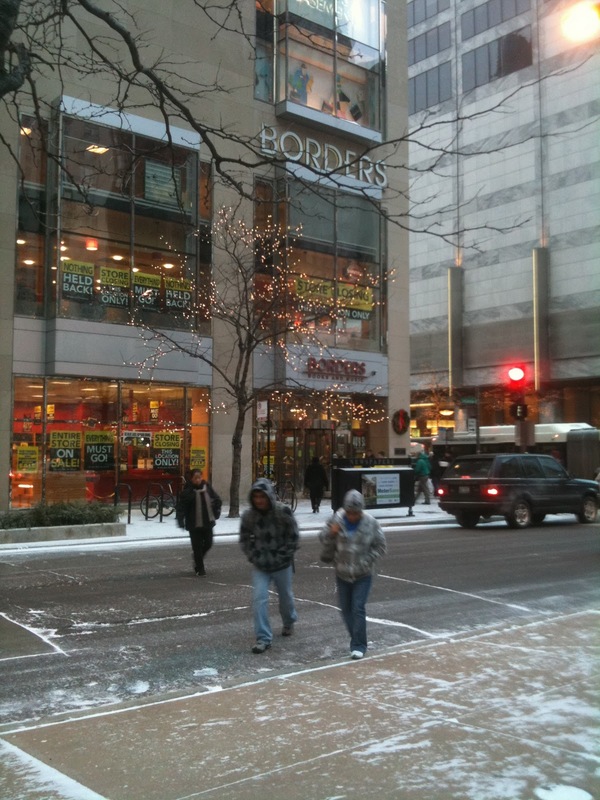 As I walked out into the frigid street, I think I heard the whimper. Most of the Borders in the UK were selling off the fittings at the end. There's something very depressing about buying the shelves when the books are gone (or worse, when they aren't, because someone high up made some very odd choices). The staff had already been informed they would lose their jobs on Christmas Eve, and they couldn't have helped anyone if they'd wanted to. No organisational system survives the loss of its shelving.